Nickervision Games is a one-man studio run by Adam Nickerson whose creed is "learning to make games by making games". He has developed several simple games over the years for mobiles and Steam with Bit Blaster XL being released on Steam a couple of years ago. So what is Bit Blaster XL? Well, it's a retro-styled shoot ‘em up similar to the classic Asteroids but you've got a whole bunch of ships with different stats (such as speed, damage, health and bombs) which you can unlock by collecting coins. There are also a lot of power-ups that change your weapon (a bit like the game Raiden) and you can get some pretty wacky ones too like flamethrowers and lightsabres! The goal of the game is simple: survive for as long as possible and get the highest score. I managed to unlock this game around the same time as Refunct, so I'm assuming I got it through the Humble Overwhelmingly Positive Bundle which consisted of a whole bunch of games that had an "Overwhelmingly Positive" Steam rating at the time the bundle was available; this is still the case with Bit Blaster XL. 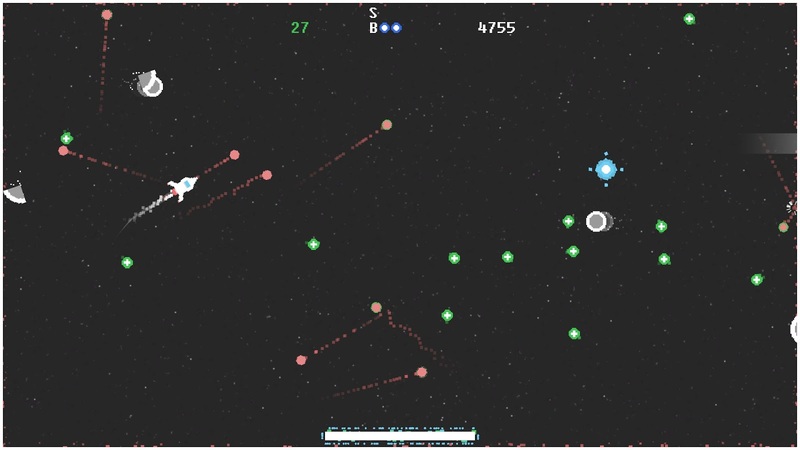 Like all good arcade games, Bit Blaster XL is really easy to pick up: all you have to do is manoeuvre your ship to avoid obstacles and enemy fire, while shooting down enemies and asteroids with your gun. While it looks like I've only played Bit Blaster XL for a short time, I've actually played several games already since each game only takes a matter of minutes to complete: an ideal game to play when you don't have much time on your hands. Only last month the game received an update, which isn't too shabby for a $1 game released two years ago. The game has an appealing chiptune soundtrack thanks to composer Spiff Tune which suits the game perfectly; best of all, the soundtrack is free when you purchase the game! The game has 17 Steam Achievements you can earn and 5 Steam Trading Cards to collect. The game is also integrated with Steam Leaderboards so you can try to beat the high scores of your friends and, if you're up for it, the world! Somehow when playing with my Logitech F710, the connection intermittently cuts out. Fortunately, it's only happened maybe a handful of times (and not sure if it's the game's fault, Steam Link's fault or the controller's) but it's still annoying. If you love these sorts of games, it's well worth the price of admission although if you want something with a plot, more depth or flashier graphics, this is not the game for you. I mean, it's also not a game I play too frequently anymore to be brutally honest, but it's always there, ready to boot up if I'm sitting on the couch with a spare 5-10 minutes to burn. A cheap but cheerful take on the classic Asteroids except with more ships to choose from and weapons too. If shmups aren't your thing, especially if they're retro-styled and lacking much depth, then Bit Blaster XL might not be worth a look but considering it's only $1 and you even get a free soundtrack to boot, I doubt it. Recommended. Is the game worth $0.99 USD? : Yes. I'd buy that for a dollar!